Crocus is a genus of perennial flowering plants, native to a large area from coastal and subalpine areas of central and southern Europe (including the islands of the Aegean), North Africa and the Middle East, across Central Asia to western China. The genus Crocus is placed botanically in the iris family (Iridaceae). The plants grow from corms and are mainly hardy perennials, and are found in a wide range of habitats, including woodland, scrub and meadows. Most crocus species and hybrids should be planted in a sunny position, in gritty, well-drained soil, although a few prefer shadier sites in moist soil. Some are suitable for naturalising in grass. The corms should be planted about 3–4 cm deep; in heavy soils a quantity of sharp grit should be dug in to improve drainage. 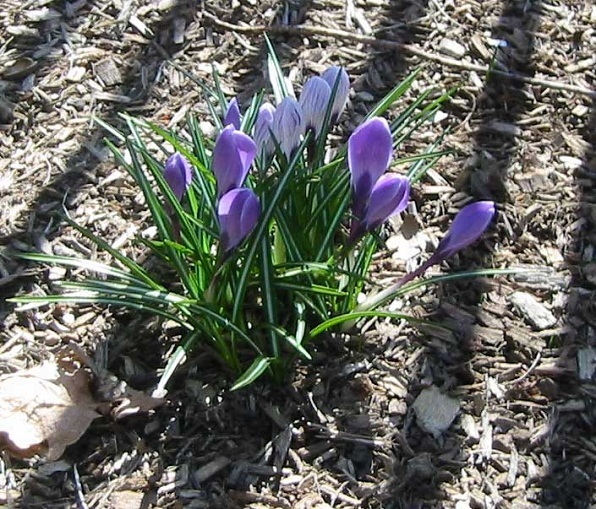 Crocuses and snowbells are the first flowers in our garden in the spring.